It never ceases to amaze me how drastically different the two sides of the border are. At the Cambodia/Thai border, the biggest difference I noticed right away was the food. It was clear the Cambodia was occupied by the French for a while – baguettes and cheese were everywhere. After two months of dreaming about a taste of home (Europe/States), we took full advantage of changing our diets from fried rice, pad Thai, and curry, to bread and cheese for a few days. I know, it sounds bland, but after accidentally burning my tongue off with spicy food at just about every meal, bland food was more than welcome. But, before indulging we took a shared taxi from the border to Siem Reap. I love the excitement of arriving in a new city. We were dropped off and picked up by a “free” tuk-tuk that took us on a round about tour of the city to try to persuade us to book a tour to see Angkor Wat with them. (Tip: Ignore them; you’ll get a lot better deal later on). We dropped our bags at the first guesthouse we found with space and headed out to find our bland, but delicious, dinner. 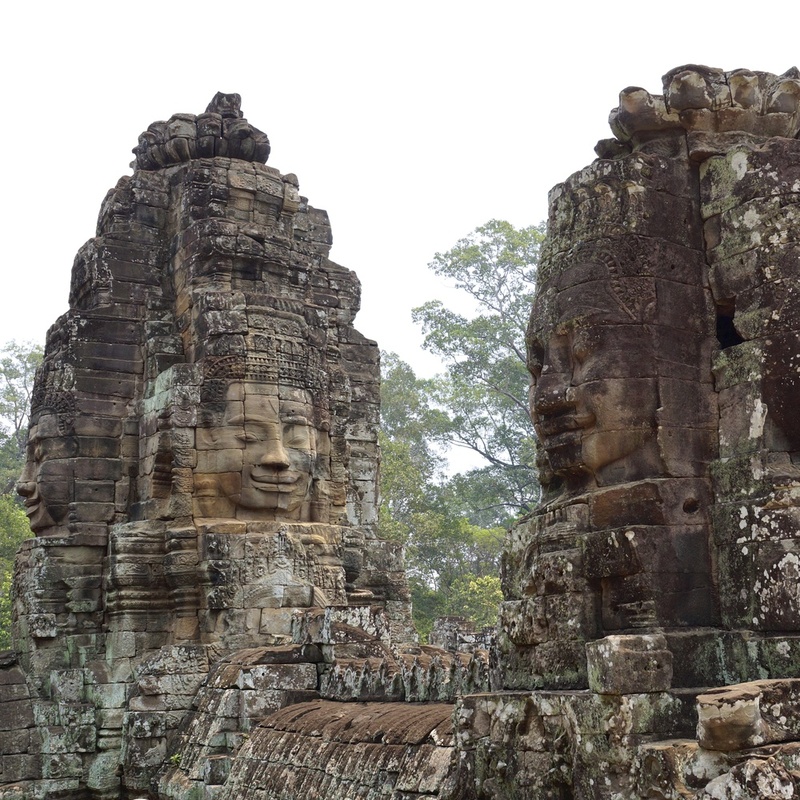 For most people, the main reason for visiting Siem Reap is to visit Angkor Wat. For hundreds of years, the temples lay hidden in the jungle. It wasn’t until 1861 that they were discovered, and today they’ve been named a UNESCO World Heritage Site. Exploring the ruins was both mysterious and magical. They were truly one of a kind. We spent the first day visiting the less known ruins, saving the main circuit to explore with Leah, a friend from Minnesota, who joined us for a week in Cambodia. Ruins around Angkor Wat were taken over by trees. The trees often broke holes in walls, or ceilings were crushed under the weight of the tree. My favorite part about exploring the ruins and temples that were off the main circuit was having an entire temple to myself. When a small piece of rock fell from the ceiling and echoed on the floor, I could hear it. And when I climbed to the top of the temples, the view was uninterrupted for miles. The construction in Angkor Wat was meticulous; they didn't stop at building temples. There was an island and marsh built in one area as well. The main circuit was interesting for different reasons. 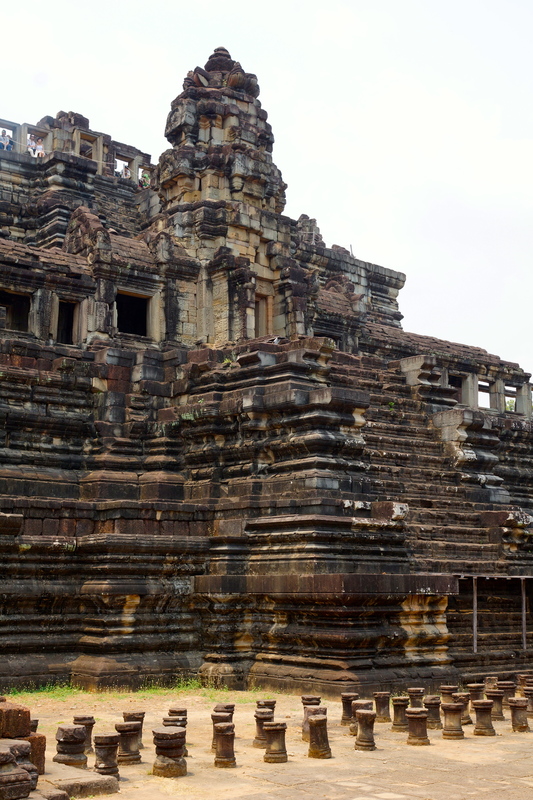 It included the more well-known temples that have undergone restoration. Our first stop was the Angkor Wat temple, which proved to be enormous. We spent three hours in the temple and that was without the detailed history from a guide. Note: Women must be wearing pants and have their shoulders covered to enter parts of the temple; a scarf doesn’t count, you must wear a shirt that covers your shoulders. Throw a thin pair of pants in your bag – I found it a bit too hot to wear pants all day! We visited at least 7 temples on the main circuit; we took a tuk-tuk between temples. Everything in the city of Angkor Wat was magnificent, including overpasses and bridges. My favorite temple was Bayon. The temple was made up of three levels, 54 towers and 216 faces. On each of the towers was a head with four faces. The upper level of the temple was circular and had lots of winding hallways to wander through. It was a fun temple to photograph and explore. On the side of the next temple there was a leaning Buddha that made up one side of the temple. Just about all I remember from this temple is Leah and I being terrified while climbing down the "steps," that seemed to be more like a wobbly ladder. One of the temples that I had been looking forward to visiting was Ta Prohm. Despite renovations, there are many parts of the temple that are inaccessible due to the ruins. Other areas were taken over by the jungle; trees tower over the ancient ruins. The temple more recently became known for its appearance in the movie Tomb Raider. That said, it’s one of the temples that’s very popular among visitors. Siem Reap is calm and relatively empty during the day. In the evening when all of Angkor Wat’s visitors return, the city comes alive. Pub Street is one of the liveliest areas in town, and as you might imagine… it’s filled with pubs. You don’t need to search high and low for an inexpensive beer either; most pubs sell draft pints for 50 cents. 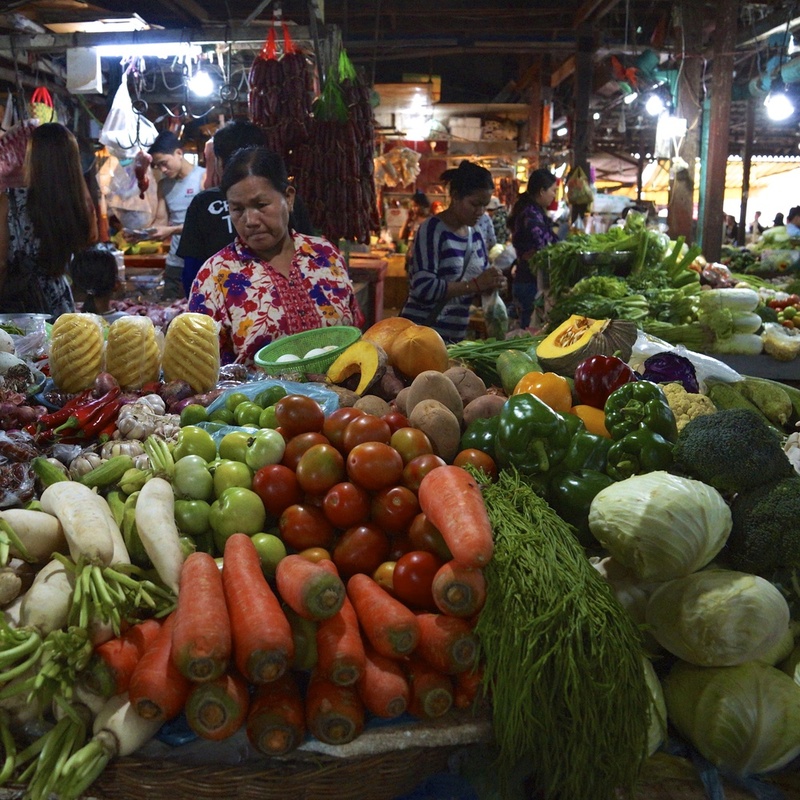 In a lot of South East Asia, there is a day market and a night market. In Siem Reap I went to both. I’ve come to discover I prefer the day markets by a long shot. 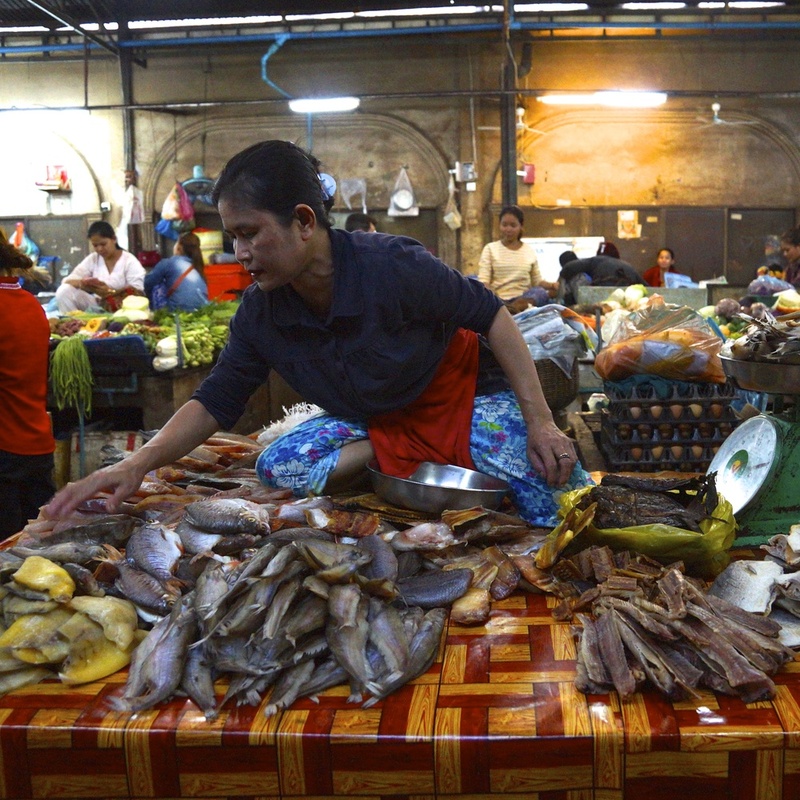 The day market has all of the same souvenirs sold in the repetitive stalls at the night market, but it also offers a glimpse at a piece of every day life – people buying rice, fish, and meat; children of the stall owners run through the narrow aisles, and people having lunch sitting on plastic stools in the small stalls. There’s a certain energy in the markets; the closest thing I can compare it to in the states or in Europe would be the weekend farmers market, except they’re 10 times bigger, a lot louder and probably a bit dirtier, too. I’ve stopped buying a lot of souvenirs while traveling. Partly, because I realized my budget was being drained on little things that I don’t use when I get home, and because I can’t carry that much “stuff” around. I do make a few exceptions however and when I do, it’s usually for my “future kitchen.” The kitchen will be well a trip around the world in and of itself, for now it’s in my parents’ basement. In Cambodia, I really liked their woodwork. They make all sorts of things – bowls, plates, and platters – out of bamboo. I bought a beautiful bamboo plate that will be great for serving appetizers when friends and family come over (you know, when I have an apartment someday). Never forget, you can barter in a market. It’s not rude, it’s part of the culture, and if you don’t you’ll get ripped off. I bought the plate for 5 USD; the asking price was 25 USD. Every now and then, it’s nice to take an evening to have dinner or a drink somewhere that’s not a street cart. In Siem Reap we found the cutest café-bar-restaurant called Asana Old Wooden House. The seating was hanging beds that swung in the breeze, hammocks hanging around tables, or chairs on a small terrace that felt like a tree fort. Piña coladas on this side of the world prove to be delicious – you can’t get much better than fresh coconut and pineapple juice. At Asana, they were delicious. The cheese and meat platter hit the spot, too. Visiting Angkor Wat was a once in a lifetime experience. It was incredible to discover temples that were built, abandoned, taken over by the forest, and finally rediscovered. It was a fantastic place to begin our travels in Cambodia.